Made succulent by a thin layer of fat, lamb riblets are meaty enough to serve as an entree and tasty enough to gain appetizer status. Cut from the spareribs of the lamb, riblets respond well to a variety of cooking methods and can be cooked over dry or moist heat. Marinate them before cooking to bring out the flavor and natural tenderness of the riblets. Marinating lamb riblets gives you the opportunity to introduce new flavors using a tried and true cooking method. Experiment with different marinade recipes or simply change up a few ingredients to create an entirely new taste. Make a classic rosemary marinade with red wine, red-wine vinegar, garlic, fresh rosemary, salt, pepper and a little olive oil. You can change it up by substituting dark rum and vermouth for the wine and adding lemon juice. For Greek-inspired lamb riblets, make the marinade with lemon juice and chicken stock seasoned with garlic powder, Greek oregano, salt, pepper and a little olive oil. Whatever recipe you choose, mix the ingredients well and marinate lamb for up to two hours in a sealed plastic bag with all the air removed. 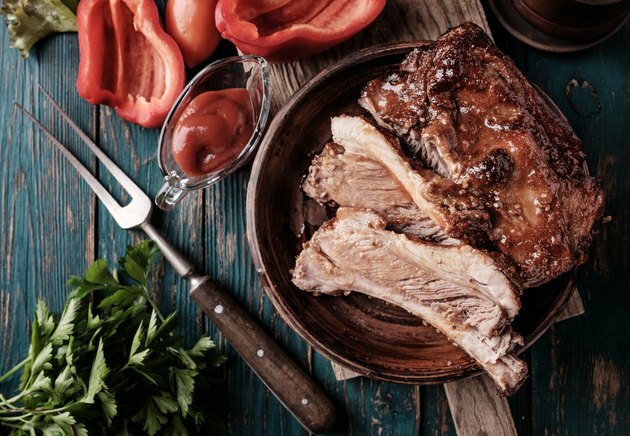 The marinade adds a lot of flavor and moisture to oven-baked lamb riblets. Remove as much of the fat as you can; the rest will come off easily after cooking, but you don't want them swimming in the fat while they cook. You can spice them up with a dry rub or season them simply with salt and pepper. Bake them at 250 degrees Fahrenheit until the meat is beginning to separate from the bones, approximately two to three hours, turning once. Marinated lamb riblets respond well to grilling or broiling. In both methods, the ribs are cooked quickly over high heat. They only take seven to 11 minutes to cook, and should be turned after four to five minutes. The riblets are done when they register 145 F on an instant-read meat thermometer. Let the riblets rest for at least three minutes before serving. Braising lamb riblets in a flavorful liquid keeps them tender and moist. Start by browning the seasoned ribs in a little oil over medium heat. Place the ribs, fat side up, in a Dutch oven with a lid. Add enough of a flavorful liquid to come the bottom of the pan and come one-third to one-half of the way up the ribs. Suitable liquids include red wine, brown broth, lamb broth or tomatoes. Cover the pot and place them in an oven preheated to 275 F for about three hours, or until the ribs are tender. Finish the ribs by turning up the heat to 375 F and removing the lid. Cook for another 30 minutes or until the fat is browned. Drain off the accumulated fat before serving.